Like any other drug dealer, there’s only ever one real motivation, and it isn't your health. Though they maintain vaccines are safe, the National Vaccine Injury Compensation Program has “issued decisions in favor of plaintiffs who were hurt by the flu vaccine”. They don’t want you to know about that though. They ignore the numbers which show an increase in adverse reactions to flu vaccines. They disregard research that shows people who received the flu shot were actually more likely to develop H1N1 than those who didn't. They whitewash it all and urge everyone to get the injections. The vaccine industry is just another money-making, good-ol’-boy network of “Crony Capitalism”. It isn't about your health or the “preparedness” of the nation for an outbreak. It’s about money. It’s about lining the pockets of the multi-billion dollar pharmaceutical industry at any cost—including if that cost is your life or that of your child. If you aren’t aware that vaccines are a controversial matter, you haven’t been paying attention. The government and big pharma would have you believe your life is at risk if you don’t vaccinate. But, growing research suggests vaccines aren’t effective in the prevention of disease and that they may actually cause more harm than good. The good news is that you have rights, and that saying no to vaccines is an option. But knowing how to say no to vaccination can be overwhelming for some people. This is particularly true for parents sending their children into schools. States set the requirements for vaccination and admittance into their school systems, and most allow for some exceptions—whether religious or personal in nature—allowing parents to avoid vaccinating their children. But, how do you know what your rights are in your states? 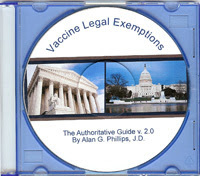 Within its pages is information on the history of mandated vaccinations, details on vaccine exemptions (for schools, military, healthcare professionals, and more), vaccine ingredients, and more than 350 medical references regarding common problems associated with vaccinations. “Parents needed a tool that did their homework for them. The evidence is there to support their decision to not vaccinate; you just have to do a little work to find it. Everyone seems to be so afraid of “bugs” and their potential ability to make us sick. But the reality is that we swim in “bugs” every day and we are not dropping over like flies.. The only “bugs” we seem to obsess over are associated with vaccines. Only two generations ago, measles, mumps and chickenpox were normal experiences of childhood. Why we have complete fear of these infections is media and money driven and unfounded.”If the focus of Public Health was on sleep, exercise, clean water and safe, non-GMO food, we would have a healthy society without vaccines, but we would not have billion dollar industries employing millions of people to keep us “healthy.” The fact is, we are a very UNhealthy society with vaccines, so the Public health and argument that we must vaccinate ‘for greater good’ is a failure. There are plenty of reasons for saying no to vaccines. The fact is, your immune system is the best fighter against illness and disease, not vaccines. If you have already received a vaccine or your child has, it is important to take some measure to ensure immediate and long-term safety by treating the immune response. When asked whether she is confident about the people’s self-empowerment when it comes to vaccines, Dr. Tenpenny says Americans “tend to be sheep,” and expresses a commonly-held belief that “no one wants to stand out, speak up and challenge authority.” Hopefully, by giving people the knowledge needed she can influence change. You can read the rest of her interview on saying no to vaccines here and see more about her book Say No to Vaccinations on the official website. Also, look at how to avoid ‘mandatory’ vaccinations through exemption. All vaccines are dangerous and do not work and have been used for depopulation through sterilisation as has occurred in Africa and will also be used for mandatory microchipping of the human population. The Verichip RFID microchips will be able to control every aspect a person’s life including financial, medical, security, location and law enforcement. If the person fails to comply then an electric shock will be administered by the chip to the persons nervous system with ever increasing levels of electric shocks including a fatal level the signal for this could be sent by the cell phone.